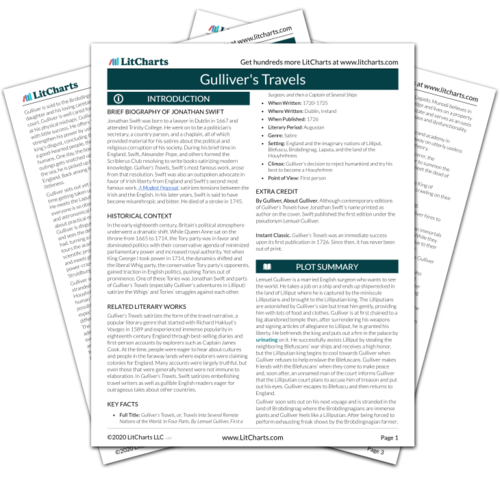 Instant downloads of all 942 LitChart PDFs (including Gulliver's Travels). 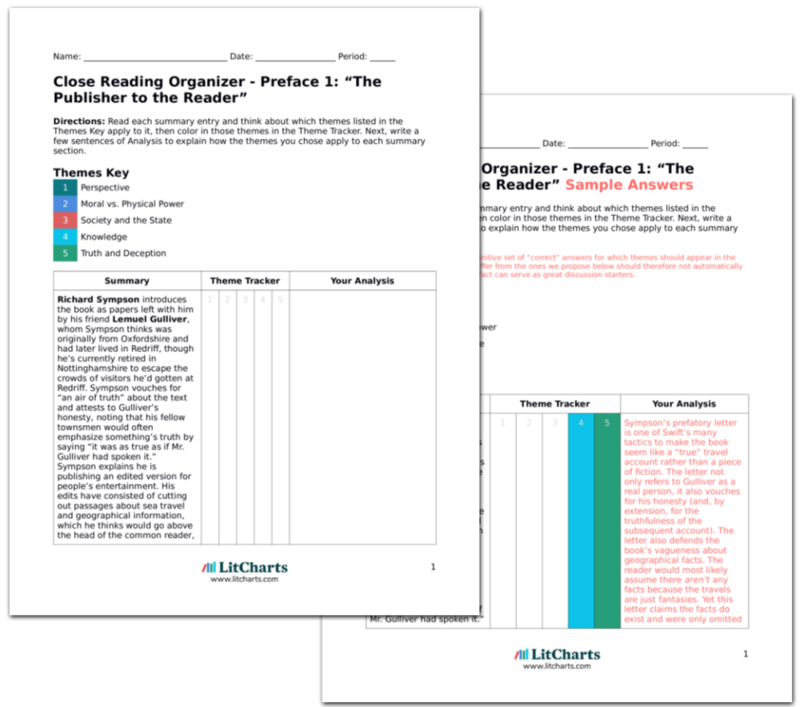 LitCharts assigns a color and icon to each theme in Gulliver's Travels, which you can use to track the themes throughout the work. The ship’s captain helps nurse the starved and panicked Gulliver back to health. When Gulliver asks if he’d seen a giant bird, he says he’s seen no birds bigger than usual, Gulliver assumes the captain must have gauged their sized incorrectly, being at a distance from them. Gulliver’s box is accidentally destroyed by careless crewman trying to extract the furniture, but Gulliver’s cabinet of mementoes is preserved and he uses them to help convince the crew that his account of Brobdingnag is true. He shows them his mouse-skin trousers. The captain believes him and encourages him to write up his adventures for all to read. The process of Gulliver’s reentry continues to highlight the inseparability of the themes of perspective and truth. Gulliver’s worldly knowledge enables him to make assumptions about other people’s limited perspectives (as he assumes the captain simply misgauged the birds’ sizes). Gulliver uses physical evidence, including the symbol of his clothing, to convince the humans around him that his story is true. The captain points out that Gulliver is shouting and Gulliver realizes he’s gotten so used to his Brobdingnag habits that he’s acting very strangely in the human world. He is amazed by the size of everyone, confessing never to have looked in the mirror in Brobdingnag out of shame for his littleness. He finds the human world tiny. The ship deposits Gulliver on shore in England and, returning home, Gulliver bends much too low to embrace his wife and can’t even see his daughter. Looking at them, he feels they are “pigmies and I a giant.” His wife begs him never to leave home again, but Gulliver soon sets out once more. Even though Gulliver knows that he is simply startled by the change in perspective and that in fact the human world is just as he left it, the power of perspective is so strong that he remains unable to adjust his behavior to line up with the world around him. Instead, he acts completely out of proportion to his situation. Ross, Margaret. "Gulliver's Travels Book 2, Chapter 8." LitCharts. LitCharts LLC, 3 Mar 2014. Web. 21 Apr 2019. Ross, Margaret. "Gulliver's Travels Book 2, Chapter 8." LitCharts LLC, March 3, 2014. Retrieved April 21, 2019. https://www.litcharts.com/lit/gulliver-s-travels/book-2-chapter-8.